In Olde Raleigh Shopping Center. By Harris Teeter. Available during lunch and dinner hours. 1 roll. Contains beef and cabbage. 1 roll. Contains shrimp, celery, cabbage, and carrots. 1 roll. Contains celery, cabbage, and carrots. 6 pieces. Cooked in a sweet and spicy sauce. 6 pieces. Contains Cream Cheese. Sauce sold separately. 6 pieces. Fried or Steamed and filled with pork. 4 pieces of bone-in ribs. Appetizer sampler containing 2 pieces of each: tempura shrimp, spare ribs, teryaki chicken, crab rangoons, spring rolls, and wings. White meat chicken, broccoli, and water chestnuts in a white sauce. (May substitute for the brown sauce upon request). White meat chicken and shredded cabbage, scallions, mushrooms, and eggs. Served with pancakes and a side of hoisin (plum) sauce. White meat chicken, snow peas, and water chestnuts sauteed in a white sauce. Breaded and fried pork, carrots, and green peppers. Served with a side of sweet and sour sauce. Shrimp sauteed with cabbage, scallion, mushroom and eggs. Served with pancakes and a side of hoisin sauce. Similar to the orange chicken. Fried pieces of chicken with a lemon zest. White meat chicken and jumbo shrimp sauteed with mixed vegetables in a spicy brown sauce. Lunch combinations are only available between 11am and 4pm for dine in or pick up only. 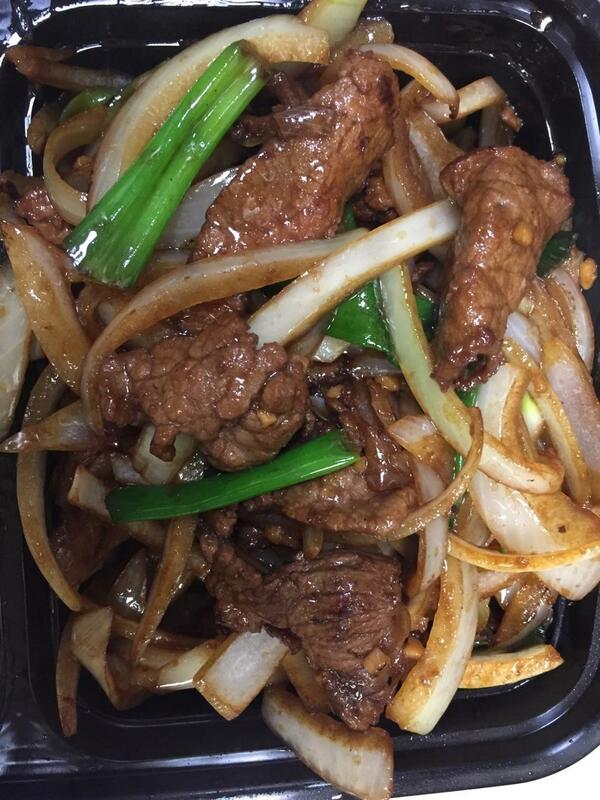 Deliveries during lunch hours are dinner menu portions, with a few exceptions. Please call to verify. All lunch entrees come with your choice of either egg Roll or soup (Excluding wings and fried rice combination). Cream Cheese. Sauce sold separately.